Christmas time is a special time in Holland: for one, we don't just celebrate Christmas Day, on December 25, but repeat it the next day, on December 26th, a day aptly called 'Second Christmas Day'. Two times the party, two times the food! On Christmas Eve, people may attend Christmas Mass at midnight and come home to have a midnight feast, also called koffietafel (literally means "coffee table"), with luxury rolls, cold cuts, cheeses, fruit preserves, hot chocolate, coffee or tea before going to bed. 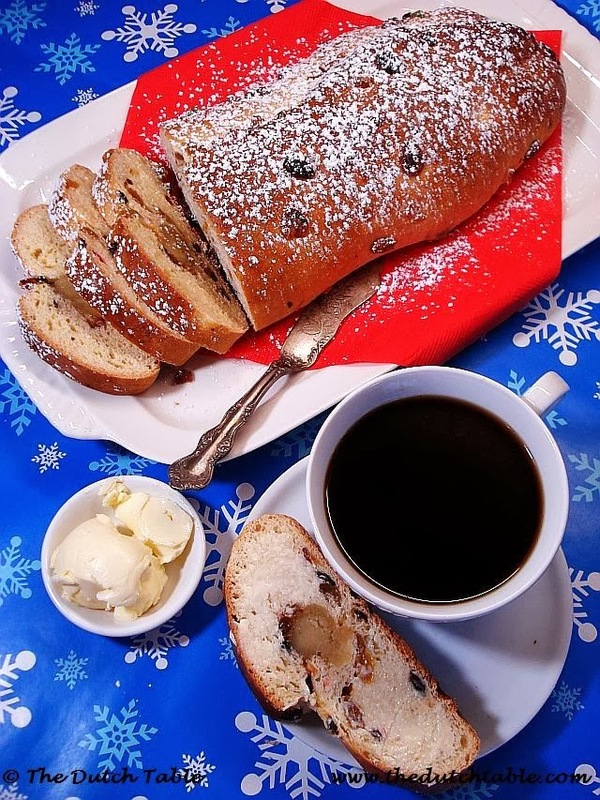 Traditionally, a luxury bread called kerststol is served and eaten at Christmas time: it is studded with candied fruit peel and raisins and sprinkled with powdered sugar. The bread is bought at neighborhood bakeries or, even better, baked at home. If the bread contains a ribbon of creamy almond paste it is called a "stol". If it doesn't, it's "just" Christmas bread. 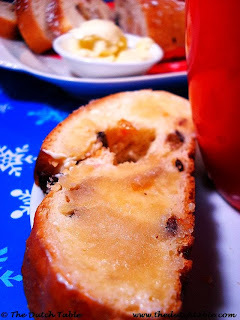 During the December holidays, buttered slices of kerststol will be part of breakfast or brunch and may be offered to guests instead of a cookie with their cup of coffee or tea. The stores and bakers will sell exactly the same bread at Easter, but then it's called paasstol. 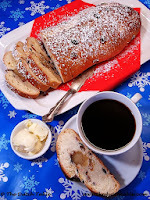 The commercially prepared stollen are heavy, chewy and rather rich. I prefer mine a little lighter so I use all purpose flour instead of bread flour. Combine the raisins and the candied fruit and soak in the orange juice, preferably overnight but at least for a good four hours. In a large bowl, place the flour. Make a well in the center and pour the warm milk in, and sprinkle the yeast on top. Let it sit for five minutes. This is a great time to pour the soaking fruits in a colander or sieve so they can drain. Stir the flour and the milk until it barely comes together. Add the sugar and the salt, stir again, and slowly add the egg, then the melted butter and the lemon zest. Continue to knead for five or six minutes or until the dough comes together. If it's too dry add a tablespoon of milk at a time. Give those raisins a quick squeeze to drain some superfluous liquid. Fold these into the dough: either by hand or in your bread mixer, but be careful that you don't tear through the gluten strands! You'll probably have more dried fruit than you think will ever fit, but keep kneading and pushing those raisins back in the dough (they tend to escape). Knead the dough carefully until the raisins and candy peel are well distributed. Grease a bowl, place the dough inside, cover and rest for an hour at room temperature or until the dough has doubled in size. Don't skip this step as the stol will be very thick and heavy if you do. Gently deflate the dough and pat into an oval. Place the oval with the short end toward you and make an indentation along the length of the dough, in the middle. Now roll the almond paste on the counter until it forms a roll almost as long as the dough. Lay the almond roll in the indentation and lift the left side of the dough over the paste. Make sure that the dough does not meet the bottom half all the way: a significant shape of the stol is the bottom "pouting" lip of the bread. If you want a more pronounced pout, fold the right side of the dough one-third towards the almond paste ribbon, and fold the left side of the dough in half, placing it on top of the bottom half and covering the paste. Rest the dough on a lightly greased baking sheet or silicone mat. Cover it and let it proof for about 30 minutes or until ready to bake: the dough should barely spring back if you poke it with your finger. In the meantime, preheat your oven to 350F. Bake the bread for 40 minutes on the middle rack, then reduce the heat down to 325F. Brush with melted butter and bake for another five minutes, then brush again and bake for another 5 minutes. If the bread is browning too fast, cover it with a piece of aluminum foil. Use a digital thermometer to determine if the bread is done: the temperature should be 190F and rising. Cool the bread on a cooling rack. Sprinkle with powdered sugar and slice. Tip: If you have any kerststol left over the next day, toast a slice until nice and golden. Whip the almond paste out with the tip of your knife and spread it on the warm slice of bread. Yummm!!!!!!!!! * Or make your own by blending 8 ounces of sliced almonds with the same amount of powdered sugar, an egg, a teaspoon of zest and a teaspoon of almond flavoring. If you have access to almond meal, substitute it for the sliced almonds. the wife is ready to kill me! I tried your Kerststol recipe the day before yesterday and it came out great as you can see here.. the only thing I changed was I did not soak the raisins and candied fruit in OJ - but used Grappa instead, to give it an extra kick !! Thank you so much for this recipe. A kerststol with christmas (and Easter) is a tradition in our family. I miss it since I live in the US. I made it this christmas and turned out great. It gave a warm feeling to get back my familie's tradition. I just found your site this morning and it was perfect timing too, since I've been looking for a Kerststol recipe (that didn't include using a bread mix) to make for Sinterklaas Day. My husband is Dutch and I've been trying to include some Dutch recipes in my repertoire and it has been quite a challenge to find authentic ones. We just moved to NYC, away from all our state-side family in Florida and all that was familiar to us. I wanted to make a seasonal treat for him that reminded him of his original home and I am looking forward to using this recipe for that purpose (since I don't think I will fill is shoes with hay and carrots- well maybe). Thanks and Prettige Feestdagen! This is a Christmas tradition here, thank you. You are very welcome, Heather! When you pat out the initial oval shape of the dough, about how thick should it be? Or, how long/wide? Thanks!